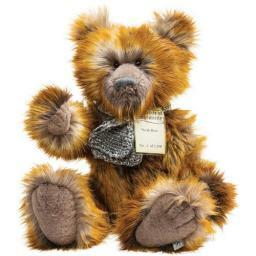 Noah is a formidable bear, cuddly and warm. He is made of multi-tone faux fur in light brown, graduating to golden caramel plush. Noah has a long pointed muzzle, with a rectangular shape nose in grey thread, a stitched mouth and a small spattering of freckles. His pads are soft boa with defined fingers and toes. Noah is wrapped up well in a knitted woollen scarf. As with all the Silver Tag bears, Noah is fully jointed, substantiallyweighted, and has a classic hump. Noah comes with an individually numberedCertificate of Authenticity. He is 57 cm standing. Noah is one of 1500. Hecan be spot cleaned.